Contract management. Paola got significantly experience in trading, negotiating, drafting and reviewing commercial contracts, such as non-disclosure agreements, distributor agreements, vendor agreements, export clause compliance. She also have developed significant experience in advising and guiding clients to remain competitive by proactively protecting their assets and shielding them from liability. She has assisted as major client in Dubai: ABM – Apple Middle East distributor, Italian Kitchen. Real estate. She regularly represents individuals at all phases of real estate transactions, from developers and investors to buyers and sellers. Both Italian national and international cases have involved representing borrowers and lenders in financing, structuring a purchase or sale, assessing tax consequences of a transaction and other related matters. Intellectual and Industrial Property Law and Copyright Law. In Italy, She has acquired experience representing both large corporations and individual clients in trademark oppositions, copyright disputes and intellectual property litigation. Bankrupsy/credit management. She was partner of the corporate restructuring bankruptcy and creditors’ rights departments at Amico & Partner law firm. There She got significantly experience in all aspects of the bankruptcy process including pre-bankruptcy workouts and debt restructuring, defense of creditors’ rights, preparation of claims and litigation in adversary proceedings. She provides counsel to help business establish internal procedures and strategies to maximize pre-bankruptcy collections and recoveries in potential bankruptcy cases. Major clients are multinational firm as L’Oreal, Motul and Sogen Fiditalia. 1998 -1999 Law University of Turin She worked with Prof. Ajany at the juridical Institute on the “Comparative analysis of the most important juridical systems” and she was a member of the related exam commission. She attended a post graduate course in international law and diplomatic career. 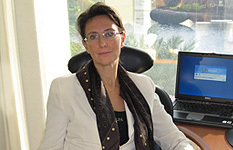 Paola is a member of the Italian Bar Association since 1995. She has also recently joined the Italian Association of trustees and lawyers pro emirates.